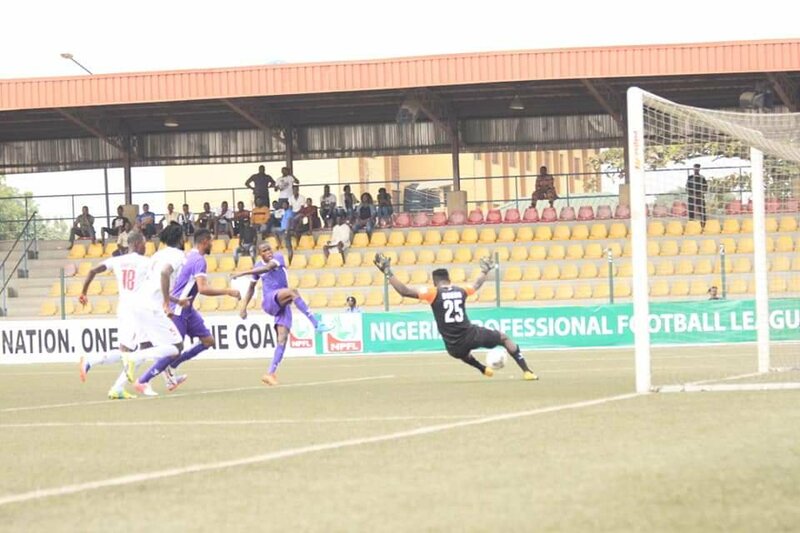 MFM forward Kabir Adeniji says his team was spurred to victory over South West rivals Sunshine Stars in Match Day 10 of the 2018/2019 Nigeria Professional Football League (NPFL) out of the need to earn bragging rights in the South West Derby. Adeniji put MFM ahead in the 42nd minute with his fourth strike of the season to help the Olukoya Boys to a 2-0 victory over Sunshine Stars and the prodigy told busybuddiesng.com that Head Coach Fidelis Ilechukwu made sure that MFM team of fledglings weren’t intimidated by a more “mature” Sunshine side. Adeniji has certainly taken the NPFL by storm and has surprised even his most ardent supporters with how fast he has adapted to the top flight. The young forward who scored three minutes into his debut against Kwara United on Match Day 2, has now struck four times in seven league appearances an incredible feat considering he had never played professional football prior to this season. The forward signed from Fabulous Strikers FC is very clear about where the credit for his performances lie – with Coach Fidelis Ilechukwu, and in a show of the levelheadedness that has served him well so far, acknowledges that he still has a lot of improvement to do. “I thank my coach for using me and making me prove myself,” Adeniji told busybuddiesng.com. “I thank my coach for the confidence he has instilled in me. I came from an academy but he told me that I can do it (play in the NPFL), he coached me and I am trying my best. When I look at him, I get the confidence that I can do it. Adeniji who could have scored a brace against Sunshine Stars described a particularly glaring miss that looked easier late in the second half as “another lesson for me that next time I need to do it right” and remains undeterred in his bid to hit the 20-goal mark in his maiden season in the top flight. “I have said it before, it’s twenty goals I am looking for, [I have] just the four now [and] it remains sixteen but I am sure that I will do it with God all things are possible,” he declared. Having witnessed the recent call up to the U-23 camp of teammate Joshua Akpudje who like Adeniji joined MFM from an academy, the forward says he is ready to represent Nigeria at any level and believes just as he has stepped up in the top flight, he would perform with aplomb if he gets the opportunity to play for his country.